Shang Ding was born in 1954 in Kunming, China, the youngest of six children. His father was a journalist and mother a factory union leader. 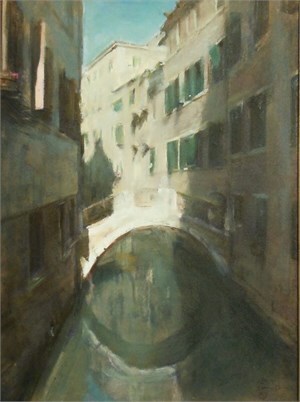 He remembers becoming intrigued by painting at the age of three, when his early efforts were guided by his brother. 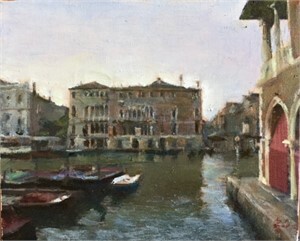 At first his father opposed his fascination with painting, but soon recognized his son's talent and became very supportive. During the Cultural Revolution, in the late 60's, many journalists were imprisoned. Shang Ding was fourteen when his parents were arrested and held for three years. His life changed dramatically. Where he was once free to play with other children, he now felt different from the others. Not knowing when his parents might return, he knew he must secure a future for himself. 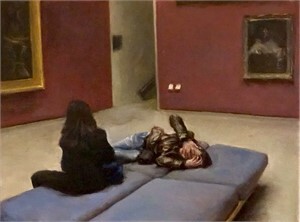 He became even more dedicated to the study of art with added introspection in his loneliness. At seventeen, Shang Ding joined the army. At night, while everyone else was sleeping, he would work at his painting under the sheets using a flashlight. Eight years of painting and working with other soldiers gave the young artist a deep understanding of ordinary people and their perseverance in the face of hardship and fear. His paintings of soldiers at war evoked the best of his talent, strengthened his character, and inspired him to continue. 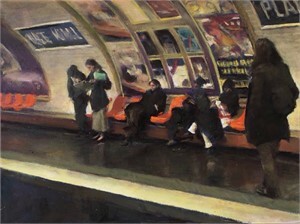 His paintings began to win awards. In 1974, Shang Ding entered a show in Beijing where his work was noticed by Mao Zedong's wife. She was greatly impressed that such talent could come from a 20 year-old. She talked incessantly about him and drew attention to his work. 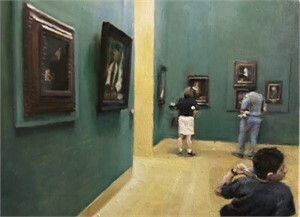 Professors from the Central Art Academy were equally impressed. 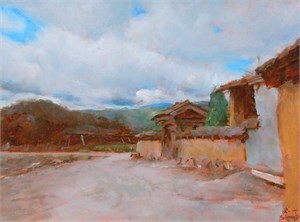 He continued his training in two major art schools in China, receiving a Masters Degree from the Zhejiang Academy of Fine Arts. Eventually, he became an Associate Professor at the Peoples Liberation Army Academy of Art and delivered regular lectures at the Chinese Central Academy of Fine Arts. In November of 1988, temporarily leaving his wife and young daughter behind, Shang Ding traveled to the US to begin a new career. He has been impressed with life in America, although the adjustments have not always been easy. "Life here is always new and changing. The culture is new and people are not afraid of change. China has such deep history and change does not always come easily." In China he had stories to tell—true tales about a hard life; but his expression was limited. While in the army, he felt pressed to communicate with his peers. Now, he wants to tell an international story, something that everyone can understand and relate to. 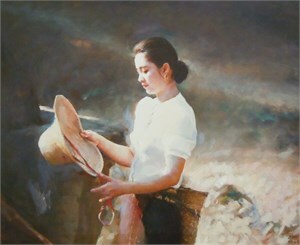 Shang Ding is a highly acclaimed oil painter and eminently respected former professor. 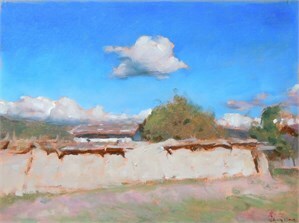 He is noted in several reference publications in China, which cite great Chinese painters since the 1700's. He documented the Cultural Revolution and Chinese army life, creating rare paintings difficult to find anywhere else in the world. 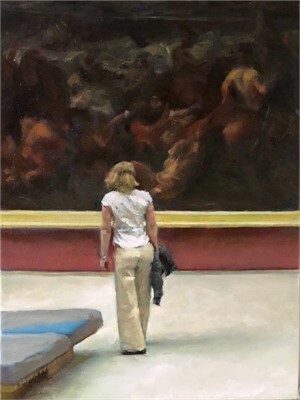 Additionally, he participated in paintings the size of football fields displayed in China and is exhibited in every major museum in China as well as Japan and several other countries. 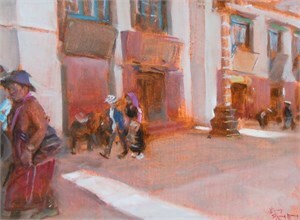 His paintings are now being collected by museums and galleries throughout the US. Shang Ding was born in 1954 in Kunming, China, the youngest of six children. His father was a journalist and mother a factory union leader. 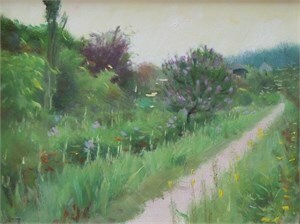 He remembers becoming intrigued by painting at the age of three, when his early efforts were guided by his brother. 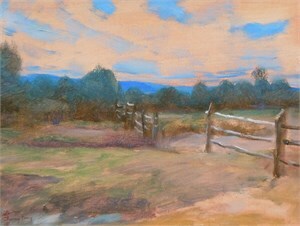 At first his father opposed his fascination with painting, but soon recognized his son's talent and became very supportive. During the Cultural Revolution, in the late 60's, many journalists were imprisoned. Shang Ding was fourteen when his parents were arrested and held for three years. His life changed dramatically. Where he was once free to play with other children, he now felt different from the others. Not knowing when his parents might return, he knew he must secure a future for himself. 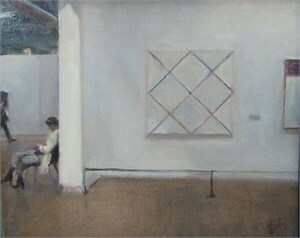 He became even more dedicated to the study of art with added introspection in his loneliness. At seventeen, Shang Ding joined the army. At night, while everyone else was sleeping, he would work at his painting under the sheets using a flashlight. Eight years of painting and working with other soldiers gave the young artist a deep understanding of ordinary people and their perseverance in the face of hardship and fear. His paintings of soldiers at war evoked the best of his talent, strengthened his character, and inspired him to continue. 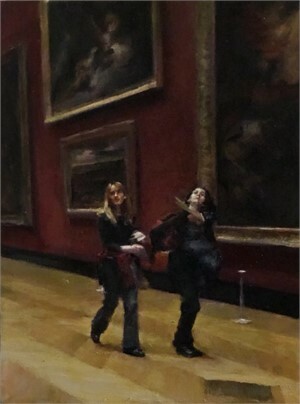 His paintings began to win awards. In 1974, Shang Ding entered a show in Beijing where his work was noticed by Mao Zedong's wife. She was greatly impressed that such talent could come from a 20 year-old. She talked incessantly about him and drew attention to his work. 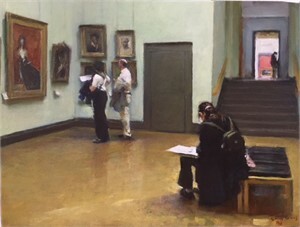 Professors from the Central Art Academy were equally impressed. 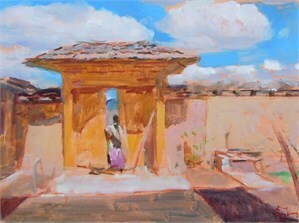 He continued his training in two major art schools in China, receiving a Masters Degree from the Zhejiang Academy of Fine Arts. Eventually, he became an Associate Professor at the Peoples Liberation Army Academy of Art and delivered regular lectures at the Chinese Central Academy of Fine Arts. In November of 1988, temporarily leaving his wife and young daughter behind, Shang Ding traveled to the US to begin a new career. He has been impressed with life in America, although the adjustments have not always been easy. "Life here is always new and changing. The culture is new and people are not afraid of change. China has such deep history and change does not always come easily." In China he had stories to tell—true tales about a hard life; but his expression was limited. While in the army, he felt pressed to communicate with his peers. Now, he wants to tell an international story, something that everyone can understand and relate to. 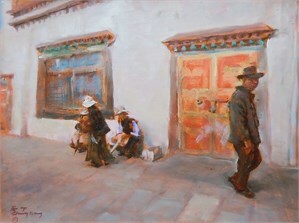 Shang Ding is a highly acclaimed oil painter and eminently respected former professor. 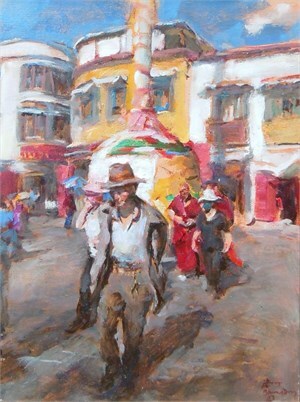 He is noted in several reference publications in China, which cite great Chinese painters since the 1700's. He documented the Cultural Revolution and Chinese army life, creating rare paintings difficult to find anywhere else in the world. 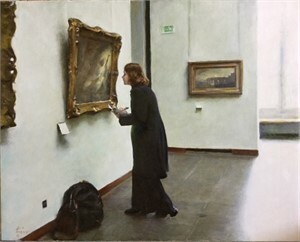 Additionally, he participated in paintings the size of football fields displayed in China and is exhibited in every major museum in China as well as Japan and several other countries. 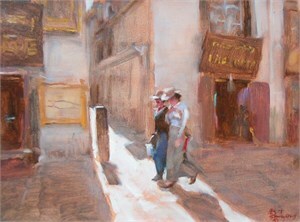 His paintings are now being collected by museums and galleries throughout the US.